Social geotagging is the process of tagging geographical data (latitude and longitude) with videos, photographs, websites, mails, and even status updates. This geotagged data shows where the status updates, photos or videos were created or modified. Being present in the social media environment for quite some time now, geotagging continues to advance and develop with time, and is now being used to leverage certain benefits for businesses and their customers alike. Social geotagging has been ingrained into the DNA of online and particularly mobile browsing experience. It is recently found that almost 10% of all American adults use some kind of location-based online service and this number is continuously on the rise as more people start using smartphones to conduct their daily business. Businesses need to understand the importance of social geotagging for customer-business interaction and effectively use it for their benefit. Usually when searching for a business customers first search for a location. Geotagging your content and other important business websites ensure that your firm comes higher up in the search results whenever a consumer searches for any local business. 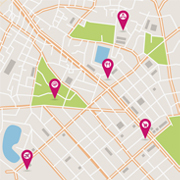 Geotagging can be used by businesses to understand which locations are performing better than the others. It also helps them collect important behavioral information about their customers. Furthermore, it becomes easier to target different market behaviors and use that data to channelize new marketing strategies in various areas. Social geotagging involves the addition of photos or videos to a particular geographical location on the map. This process simplifies various sales tracking and mapping processes while saving both time and money. Geotagging your business website can have a great influence on the way you appear in the search results as compared to a relative search term and who gets to see your business website while searching for local businesses. This ensures not only better brand awareness, but also better online visibility for your business locations, wherever in the world they may be. Geotagging helps in live monitoring and in the automation of your workforce. Geotagging also allows consumers to tag their location and let their friends know about it and also help people find local business in any particular area. The basic idea of geotagging has reached new heights in various applications such as Facebook, Snapchat, Instagram for business, etc. The future of geotagging continues to grow and develop in our technological society. It is safe to say that we can finally say goodbye to traditional maps and probably ensure that we will never get lost in an unknown area again. Geotagging helps you be aware of the area around you and what are the different experiences you can have there. Our participation in certain activities can be enhanced with the help of geotagging and making the area around you livelier. Apart from embracing the new culture of the urban area, geotagging has changed the entire perspective of communicating with others and will certainly continue to do so. This stands especially true for businesses both large and small, and how they interact with their customers and other people around them. Today, geotagged data is being used to leverage not only better customer-centric benefits, but also allows the businesses reach their target goals faster when it comes to customer retention and satisfaction. Outsource2india has been providing extremely effective geotagging services and a host of other mobile application development services to our global clientele for the past 20 years now. Our cost-effective services help our clients save energy and time which would otherwise be lost while trying to recruit and train a team of developers. Our thorough understanding of geotagging for business interaction and its benefits helps us develop new and innovative solutions depending on your needs. If you are looking for a reliable mobile app development service provider then look no further. Write to us and we will be more than happy to serve you.